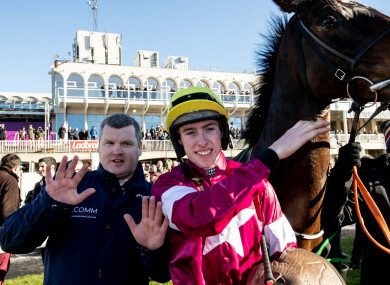 Donn McClean reflects on an incident-packed weekend at Leopardstown, where Apple’s Jade showed her class. .
Gordon Elliott and Jack Kennedy celebrate winning the race with Apple's Jade. WHERE TO START with the Dublin Racing Festival? Apple’s Jade. That’s a good starting point. Gordon Elliott’s mare was brilliant in winning the BHP Insurance Irish Champion Hurdle on Saturday. Jack Kennedy sent her off in front from flagfall, and it never looked like she was going to be caught. The further they went, the further clear she went so that, by the time she reached the winning line, she was 16 lengths clear of her nearest pursuer, Supasundae. Before Saturday, the Apple’s Jade/Cheltenham Festival talk centred around the Mares’ Hurdle. Race over two and a half miles against members of your own gender. Since Saturday, however, it appears that the Champion Hurdle is at the top of Apple’s Jade’s Cheltenham Festival plan. It makes sense to change your plans when you are enlightened with a new and relevant piece of evidence. And Saturday’s evidence was new. We knew before Saturday that the Gigginstown House Stud mare was dynamite over two and a half miles, and we knew that she had won two Christmas Hurdles over three, but we didn’t know that she could put up a performance like this one over two miles. The last time she raced over two miles before Saturday was in November 2016, in the Fighting Fifth Hurdle at Newcastle, when she was beaten by a nose by Irving. Her last run before that was also over two miles, when she was beaten by Rashaan in the WKD Hurdle at Down Royal. But Saturday’s performance over two miles was top class. Melon may have run below expectations in finishing only fourth, but runner-up Supasundae is a high-class performer. Jessica Harrington’s horse stays three miles, but he is also high-class over two. He won this race last year and he won the Punchestown Champion Hurdle last April over the minimum trip. And Apple’s Jade beat him by 16 lengths. Also, the winning time was fast, even allowing for the fact that the final flight was omitted. It was faster than Racing Post standard time and it was over four seconds faster than the time that Off You Go clocked in winning the Ladbrokes Hurdle, run over the same course and distance 35 minutes later, when the final flight was also omitted. Timeform gave Apple’s Jade a rating of 167+ for this performance, the highest rating that they have awarded her thus far in her career. It may be that she is even more effective over the minimum trip than she is over further. She deserves her shot at Buveur D’Air in the Champion Hurdle. Sir Erec was also seriously impressive in winning the Tattersalls Ireland Spring Juvenile Hurdle on Sunday. Like Apple’s Jade, the Joseph O’Brien-trained colt set off in front, and he didn’t see a rival until Mark Walsh pulled him up after he had crossed the winning line, six lengths clear of his stable companion Gardens Of Babylon. There was an awful lot to like about this performance from JP McManus’ horse. He travelled easily in front, and his jumping warmed up as the race developed. His jump at the second last flight put his pursuers under pressure, and his jump at the last just about sealed it. Even so, he bounded up the run-in, coming further and further clear, just to be sure to be sure. This was just the Camelot colt’s second run for Joseph O’Brien over hurdles. He was a high-class stayer on the flat when he was trained by Aidan O’Brien. He won a listed race at Limerick heavy ground by four lengths last October, and he finished a close-up third behind Stradivarius in the Long Distance Cup at Ascot on British Champions’ Day a week later. In just five runs on the flat, he achieved and official rating of 109. He is a high-class recruit to hurdles. He was good on his debut over hurdles at Leopardstown’s Christmas Festival, getting home by a neck from Tiger Tap Tap. But he improved significantly on that performance on Sunday. Sunday’s race is a really strong pointer to the Triumph Hurdle too. Five of the last seven Triumph Hurdle winners ran in the Spring Juvenile Hurdle: Countrywide Flame, Our Conor, Tiger Roll, Ivanovich Gorbatov and Farclas. It is correct that Sir Erec is favourite for this year’s Triumph Hurdle. The Unibet Irish Gold Cup may have been impacted by defections – in the end, there were more non-runners than there were runners – but it still served up one of the most enthralling races of the weekend, with Bellshill getting up to beat Road To Respect in a thriller. This was a Ruby Walsh masterclass, not just in the finish, but also in the lead-changing manoeuvrings that went on out in the country. He sat in Road To Respect’s slipstream on the run from the home turn, and he filled his horse up as much as he could on the run to the last, happy to allow the leader over a length’s worth of leeway in order to do so. He didn’t really go for his horse until after they had landed over the last but, when he did, he delivered him with a perfectly-timed run to get up and win by a short head. Road To Respect may have lost the race, but Noel Meade’s horse lost little else, and both horses are legitimate Cheltenham Gold Cup contenders. Road To Respect finished a gallant fourth in last year’s renewal on ground that was softer than ideal over the extended three-and-a-quarter-mile trip. He will go back there this year, a year older, a year stronger, and he will probably be presented with more suitable ground on which to race. He is a player all right. Bellshill is also a player. Willie Mullins’ horse has now won five of his nine chases, and he proved beyond all doubt on Sunday that he can go left-handed as well as right-handed. He is a nine-year-old, but he is a lightly-raced nine-year-old and, winner of last year’s Punchestown Gold Cup, there could still be more to come. Email “How d'you like them Apple's? Gordon Elliott right to eye Champion Hurdle after Dublin victory”. Feedback on “How d'you like them Apple's? Gordon Elliott right to eye Champion Hurdle after Dublin victory”.